I think photography is one of the sweetest and most personal gifts you can purchase for someone you love. An artful portrait session isn't a gift you see coming. It's not always something a friend or a sister will splurge and buy for herself, and it's a gift that gives and gives for generations. Lucky for us, this is exactly how we met Stacy & Blake! Four years ago, Kent & Carolyn Photography held a facebook contest for a free family session. Stacy's sister, Rachel, was a contestant. She tried her heart out to get that session for her family, which at the time, consisted of herself, her husband, and her two sons. When she didn't win, her best friend from Texas contacted us privately and asked if she could purchase the session for Rachel as a gift. Of course, we said, "Yes!". Since then, Rachel's family has found itself a special place in our hearts, and we have watched them welcome two more children into the world. So, you can imagine how absolutely delighted we were when Rachel asked us if she could gift an engagement session to her lovely sister, who would be traveling in from Georgia to greet the arrival of baby number four. 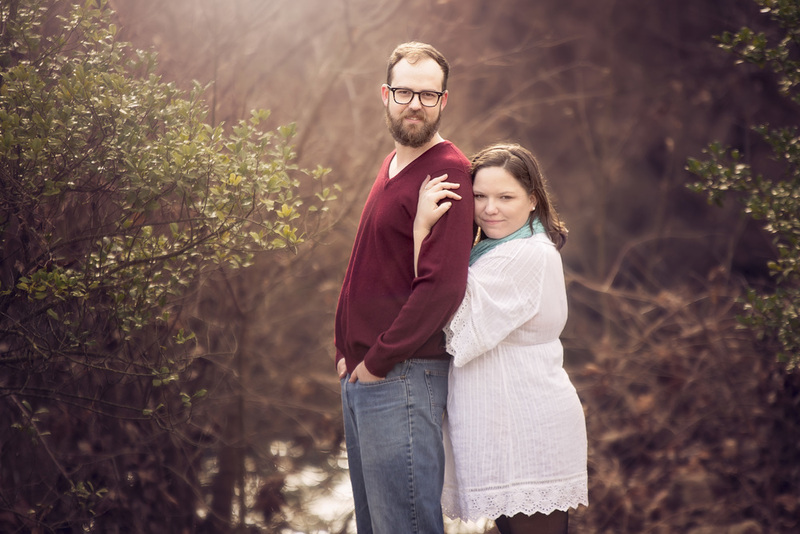 We are honored to be able to document another exciting change in their family! We clicked with Stacy & Blake right away! They are outgoing, sweet, and genuine. The first thing we noticed about them is the way they look at each other. I'm pretty sure all of my favorite shots from their session have them facing each other because that's when they seemed to give the best smiles and most comfortable facial expressions. That's love!! After a little while of walking to some of our favorite shooting spots in downtown Springfield, MO, we needed a break and a some place to warm up. First, we stopped by the Mud House and picked up a few delicious, warm drinks. Then, we walked over to check out the renovations to the newly re-opened Hotel Vandivort. Thank you, Hotel Vandivort, for your hospitality! And thank you, Stacy & Blake for a lovely January afternoon! We hope you enjoyed your trip to the Ozarks! We just know your wedding day is going to be as amazing as you are, and we wish you many, many years of love and laughter!